At this point I’ve pretty much decided that November is the worst month in the calendar. Unless you’ve been living under a rock, I’m sure you’ve noticed that this November has been particularly crappy for the usual world-event reasons. But it seems like November really had it in for me on a personal level this year. It actually started on October 29, when I was supposed to go to a Halloween party but got knocked flat by a fever. That fever lingered… and lingered… and lingered, until last Friday when I was finally able to get in to the doctor, where I was diagnosed with both walking pneumonia and an ear infection. I’ve been on antibiotics for that, but then yesterday I started showing signs of something going on in my throat—possibly the revenge of the tonsillitis/viral strep I had earlier this year. Needless to say, feeling better has been something that’s seemed a long way off. Add to that an unexpected loss this morning. If you follow me on social media, you may have seen me post about my sassy 20-and-a-half-year-old cat. She actually was still very sassy even this morning, stomping around as usual and letting us all know her dissatisfaction with the staff via her loud and boisterous meows. But then around 8:30 she suddenly fell over and never recovered. We think she may have had a stroke, though at her age it really could have been anything. We were very fortunate to have had her for so many years, and that she was in such good health until the very end. I suppose you could argue that it shouldn’t have come as a surprise considering that she was 98 in human years, but it still was a shock because, as I said, she was in very good health. 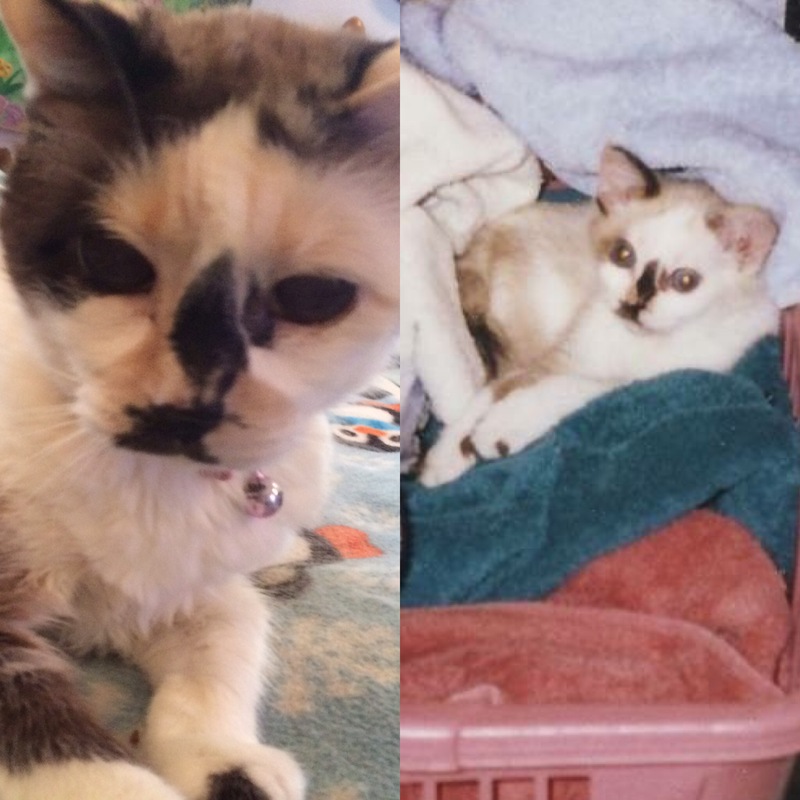 I’m 31 now and I’ve had her since I was 10 years old—she was just a five-week-old kitten when we brought her home from the vet, where she’d been brought by a good Samaritan who found her abandoned on the street—so she’s been part of my family for 2/3 of my life. It was really hard to think of her as anything but a permanent fixture. Compounding this loss was the fact that it’s been almost exactly one year since we lost my dog after a lengthy mystery illness. When I went on Facebook this morning, after my cat got sick but before she passed, when we weren’t sure if she was going to pull out of it or not, Facebook so kindly shared with me a “memory”: a status from last year worrying about my dog and the fact that she was deteriorating so much even though none of the vets could find anything wrong with her. Thanks, Facebook! You always know how to kick a person when they’re down. So, as you can see, November clearly has it in for me. I will keep plugging along, but if you’ve noticed that I’ve been quiet online recently, that’s why. The pneumonia ate the first half of November, and I’m not really looking forward to what the second half might bring. I’m hoping I will have some good news for you all soon, but in the meantime, try to hang in there and I will do the same. Condolences, from a mother of four, also deceased. Thank you so much, Eleanor, I truly appreciate it. It is so hard to lose them!